We Are The World: What Say You? I felt this photo of Brad in Hawaii deserved a post all to itself. Hope it makes you laugh like it did me! It'll brighten up my entire day, fo'shizzle. 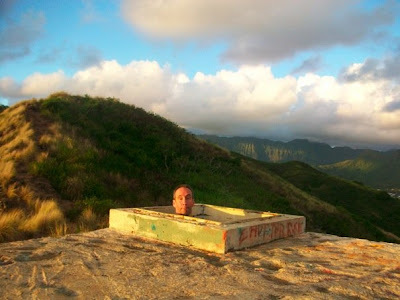 He had such a good time on vacation, this is a bunker at the top of one of the mountains that we hiked up to watch the sunrise!!! I was hoping you'd explain this one. I remember sunrise in Hawaii - awesome!